The simplest way to reach Val Gardena is to follow the Brenner Motorway A22. Coming from north, follow the route Innsbruck-Brenner-Chiusa. Coming from south, follow Verona-Trento-Bolzano. 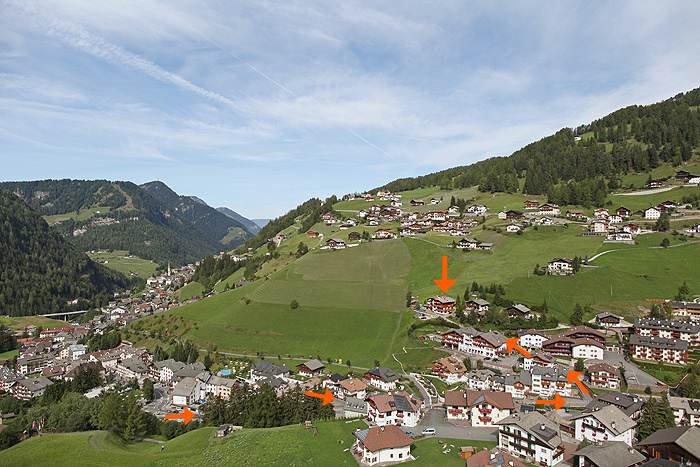 Take the „Chiusa/Val Gardena“ exit. After about 20 km, along the panoramic road SS242, following the road signs to „Val Gardena/Grödental“, you should reach S. Cristina. Once in S. Cristina at the Dosses square turn left in to the Cislesstreet. IC- and EC trains take you to Bressanone and Bolzano. Some trains stop in Chiusa too. A bus service transports you (Southtyrolian Traffic Confederation) in about an hour to Val Gardena.